.50-70 caliber, 32" barrel, Gardner Patent Gun Serial Number 2 is a single barrel with single feed guide and operated by hand. William Gardner is believed to have had Serial No. 2 manufactured, based upon his patents of 1876 and 1879, by the Pratt & Whitney Company. 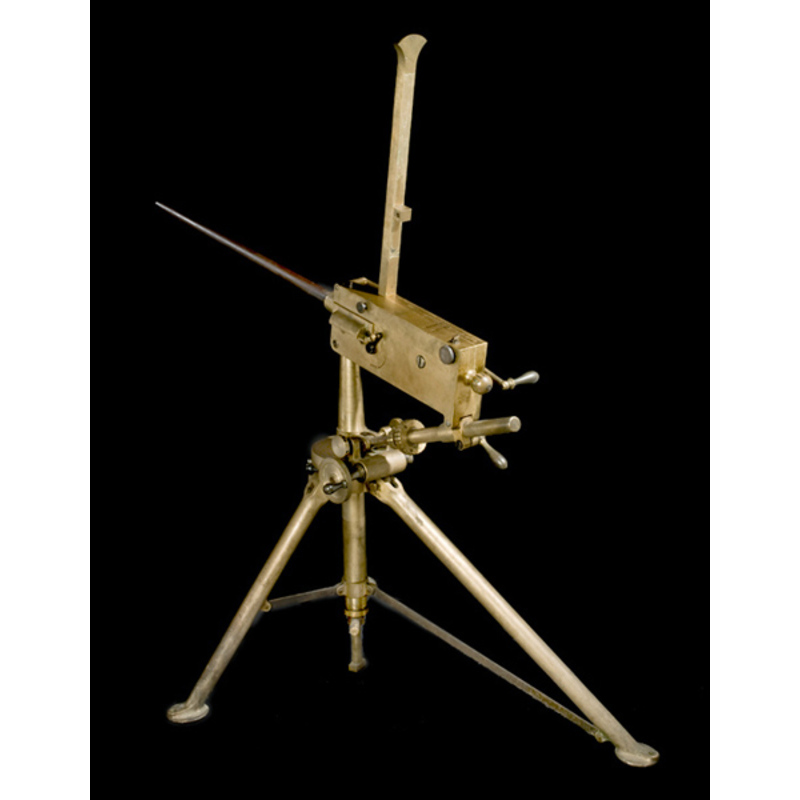 The weapon offered here is the Patent Gun that William Gardner had tested by the U.S. Navy, tried by the British Admiralty and British War Office, and other European governments. This is the very gun that Alexander Gardner took with him to Paris in 1878 for and exhibition in Paris with similar inventor’s machine guns in which Mr. Gardner’s gun took first place. This gun was used in competition against the Gatling gun. Mr. Gardner's gun won in Europe, but not in America. Overall length 45", height 38". Accompanying this lot are three 4" x 6" albumen photographs at the machine gun trials in 1887. The information on this gun comes from an article in the 2004 American Society of Arms Collectors Bulletin No. 89 by James W. Alley. The article was entitled Rifle Caliber Artillery; The Gardner Battery Gun. The exterior of the barrel has turned a plum brown and the action exterior has a very pleasing untouched brass patina. The internals are brass with the exception of a few pins and the bolt, which are in the white. The internals are almost in the same condition as when the gun came from the factory.